Protect your smile and overall wellness. Periodontal disease (gum disease) can often begin painlessly and unnoticeably. While your dentist will be able to detect it, you may not be aware of it until it’s too late. Unfortunately, periodontal disease is the number one reason as to why adults need teeth extraction. Luckily, there are ways to prevent your gums from becoming infected, and your dentist has ways of slowing down or even reversing the disease. How does periodontal disease form? Your gums are a soft tissue that bond against your teeth. Ideally, your gums will stick to your teeth to help keep them strong and in place. 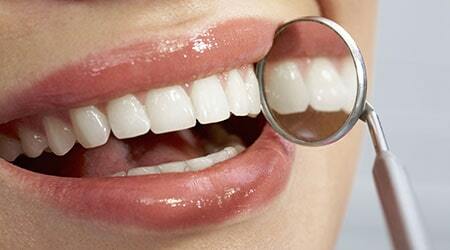 Healthy gums are generally a light pink color while unhealthy gums are dark red and inflamed. As plaque rests on your teeth, your gums begin to become irritated due to the high presence of bacteria. The gums will then begin to slowly recede from your teeth which can lead to loosened teeth, exposed bone, and damage to the exposed areas. When plaque is allowed to stay for long periods of time (such as when not flossing or brushing daily), it will begin to form a harder substance called tartar. A dentist can only remove tartar, and if left untreated, it will begin to push your gums away from your teeth. Periodontal disease begins from this vicious cycle: Tartar pushes your gums away exposing more of the tooth, and then more tartar begins to form in this area of the tooth. If left untreated, your teeth will be at risk of becoming loose, and the exposed bones can become painfully damaged. Healthy gums are generally pink and will not bleed during regular flossing and brushing. While a little bleeding during your first few times flossing is to be expected, it should not be a continuous experience. While some plaque and even a little tartar may be found on your teeth, your gums continue to be healthy and there is no current risk of bone damage. Once the plaque is removed, your gums will feel as good as new. Should the plaque and tartar be left untreated, you may get periodontitis. This is when your gums begin to separate from the teeth which can expose the bone. This creates pockets for new bacteria to form, and the cycle will continue unless treated by a professional. If left untreated, it will continue until the bone is excessively damaged which risks infection and loosened teeth. Changes in how your teeth fit when you bite. If you have any of these symptoms, you are advised to consult your dentist as soon as possible. Periodontal disease can be stopped in its early stages, and it can be maintained even in its advanced stages. However, it’s important to stop it early so that you can minimize the damage and recovery time! Very professional, experienced, and polite. Drove all the way from San Jose for an appointment! Would definitely recommend to friends and family.